In Part 1 of this two-part exploration of modeling innovation adoption I introduced the reader to Everett Rogers’ basic model as modified by Geoffrey Moore to account for a chasm-like effect that occurs in technology adoption. I then applied Moore’s variant model to the adoption of enterprise search technology in BigLaw firms over the past 15 years or so. The model nicely fit the general fate of one of the pioneering enterprise search technology companies (Recommind) and described reasonably well the general market behavior of, both, law firm adopters and vendors. In this Part 2 post I look at extending the model to technology adoption inside a BigLaw firm and consider the implications for improving internal adoption of new technologies, again referencing enterprise search for examples of chasm-crossing implementation issues. As explained in Part 1, Rogers’ innovation adoption lifecycle model identifies five different adoption groups. The adoption lifecycle proceeds in a consistent way between the five groups and presents itself as a classic bell curve. Moore’s main contribution was to note that there are two minor cracks that impede progression between two sets of the groups and a major “chasm” that stalls progression at a critical stage. The adoption lifecycle graph presented in Part 1 is reposted below, but this time I have correlated each of the stages with the law firm groups that, in my estimation, best fit the model. The attributes of a group as defined in Moore’s model will never match every member of a group defined by role/function in a law firm. At best, we would expect that a typical member of the specified law firm group will behave consistently with the corresponding model group. For example, my applied model predicts that a typical or average senior associate will behave consistently with the Early Majority group, but some senior associates will behave like Early Adopters and some will show up in Moore’s Late Majority and a few might even register as Laggards. The red line separates groups based on whether they are primarily focused on generating or managing legal content and legal services (above the line) or non-legal support services (below the line). It is a largely arbitrary divider for a number of the groups (KM, PSLs, Research Staff, LPM, and Paralegals) and does not signify a critical distinction in terms of adoption behavior. The specified groups, as labeled, are generalizations and do not represent all possible classes of lawyers and support functions in a typical BigLaw firm. The [Owner Function] and [Disrupted Function] are placeholders for the staff or administrative functions most directly involved in purchasing and supporting the new technology (“owner”) and negatively impacted (“disrupted”) by the new technology, if any. Junior Associates. Junior associates, already tech-savvy but inexperienced in substantive legal matters and practice, draw upon internal references for legal guidance but turn to their external experiences and expectations for technology-related behavior (i.e., horizontal referencing is expected of Early Adopters). For juniors discontinuous technology change is an attractive and promising force (the same applies to Early Adopters in Moore’s model). Senior Associates/Attorneys. Diversity and individuality in behavior – prevalent in junior associates and a trait of “visionary” Early Adopters in Moore’s model – is weeded out over time as associates leave the firm. Those remaining become increasingly homogenous and herd-like in their skittishness toward the unknowns of new technology. They wait for others to test the waters but are anxious not to be culled out as stragglers either. This is exactly the kind of behavior that causes the chasm conundrum. Partners and Counsel. This group is fully (in)vested in the firm status quo. Technology change must be safe and simple, requiring little effort and disruption of their busy schedules. As is the case for the Late Majority in the model, partners are strongly motivated by cost and economically provable benefits associated with committing to new technology. Senior Partners. Long term economic or other benefits do not motivate this group. They are rightly skeptical of any benefits likely to accrue to them personally from technology change and fear the effort required to break entrenched habits and to learn new technologies. Owner and Disrupted Functions. Most software applications and hardware systems in law firms are purchased by or for the benefit of a staff/admin function. That function effectively “owns” the technology and is responsible for using and supporting it. (Note: many firmwide systems and the networking/hardware infrastructure are owned by the IT function.) A functional team or department “owner” becomes the de facto Innovator with respect to internal adoption of technology it “owns.” For instance, in most firms KM “owns” enterprise search and takes the lead when enterprise search is introduced into the firm. On the back end, new technology sometimes encroaches on, curtails or even eliminates an existing function. Any such “disrupted” function is likely to resist the adoption and behave like Moore’s Laggards. Traditional vs Non-Traditional Functions. Traditional functions that have existed in law firms for a long time (e.g., accounting, records, HR) will generally skew toward the right side of the adoption model. They tend to be the keepers of the firm’s norms and enforcers of the firm’s rules and procedures. Conversely, non-traditional functions with less established roles and expectations will skew toward the left side of the adoption model. Support Relationship to Lawyer Groups. Support functions will generally align with the adoption lifecycle position of the lawyer group they primarily report to and support. For instance, the business development function works most closely with partners. Of necessity, business development must be attuned to the technology adoption attitude and appetite of partners in the firm. Counterproductive Implementation Segmentation. According to Moore, one of the big mistakes innovators make is to push into the mainstream market with the same incomplete product, support level and marketing strategy that succeeded with Early Adopters. Law firms commonly commit a similar error by rolling out new technology by office, practice or even across the entire firm all at once. This almost guarantees that only the receptive Early Adopter subset of targeted users (typically, junior lawyers and some admin/staff functions) will fully adopt the technology. Crossing the law firm chasm calls for staging the rollout differently. After a successful pilot, identify a segment of the firm (practice group, client team, office, whatever) and specifically target and concentrate support to ensure successful adoption by the Early Majority of that one firm segment (typically, senior associates, senior attorneys and associated admin/staff). What is needed to pitch and promote to them, to train them and to deliver an appropriate UI/UX to them should be the primary focus at this stage. Concentrate implementation resources by limiting size of the “beachhead” (i.e., pick a manageable firm subsegment) and deliver the “whole product” to that one subsegment. Establish success before moving on to other segments of the firm. The Whole Product and Nothing But the Whole Product. You cannot expect to successfully cross the chasm if you do not have a “whole product” solution. That means a fully supported and well integrated solution that addresses all of the reasonable expectations of the target audience. With enterprise search, for example, the “whole product” means all data sources relevant to the target audience are crawled and included, not just some or most of them. It means the search interface is incorporated into the target audience’s familiar tools. It means results relevancy and displayed metadata is tuned to the target audience’s needs. Anything less will likely send them back into comforts of old habits. The 80/20 Success Trap. Early Adopters are satisfied with an 80% solution because they have the technical skills and willingness to provide the other 20% themselves. For example, Early Adopters of enterprise search are comfortable with and even relish the opportunity to construct complex search strategies using the new tool. Early Majority adopters expect something easier than their current search folders and Late Majority adopters expect Google-like simplicity. Do not let Early Adopter enthusiasm and positive feedback mislead you into believing that you can easily replicate their satisfaction across the chasm. Resist the temptation to kick off that (probably already delayed) firmwide rollout too soon! Beware of Innovative Partners. Having a partner champion to help you push forward a new technology initiative is a good, and even necessary, thing. But be careful. Partners that are enthusiastic supporters of new technology are – in terms of the model – two standard deviations from the typical partner adoption behavior. Their influences on the direction of the initiative may become a distraction from what is really needed to target the mainstream market of senior associates and partners in your firm. Product and Firm Adoption Lifecycle Misalignment. Consider what happens when a law firm tries to push its internal technology product adoption across the chasm before the product vendor has successfully traversed the chasm in the broader product market. Either the law firm’s effort will fail outright because the vendor has not delivered the “whole product” needed to achieve buy-in from pragmatically oriented and gun-shy senior associates on-up or the law firm will have to fill in the missing pieces through internal development and/or external consulting and integration assistance. The former option is costly to the project’s credibility. The latter is just plain costly. Especially for early law firm adopters of enterprise search, some combination of both of these outcomes occurred in mid 2000s. The adverse effects may still be lingering in those firms. Revenge of the Disrupted Laggards. The introduction of new technology in law firms often disproportionately disrupts one of the groups noted in the adoption lifecycle. The disruption can adversely affect the project even if it does not result in actual job losses. More commonly it appears as a shift in control, dependency, expertise or functional authority. In short, when new technology empowers lawyers as end users (as it often does), it also marginalizes the staff that previously supported the function. Whether it happens consciously or subconsciously, passively or aggressively, the affected staff will almost inevitably adopt the Laggard position. This might well come as a surprise to the Innovator lead team because these “laggards” behave in other contexts like Early Adopters or Early Majority pragmatists. For instance, the introduction of enterprise search can easily turn PSLs, research specialists and library staff into laggards if they see themselves losing control as gatekeepers to the firm’s intellectual resources. The obvious solution here (not always easily achieved) is to make the affected group a co-owner of the new technology. This must be done very early on at the Innovator adoption stage (i.e., vendor selection and proof of concept) and before Early Adopters start singing their praises of the technology, which will otherwise be perceived as a threat by the affected support staff. 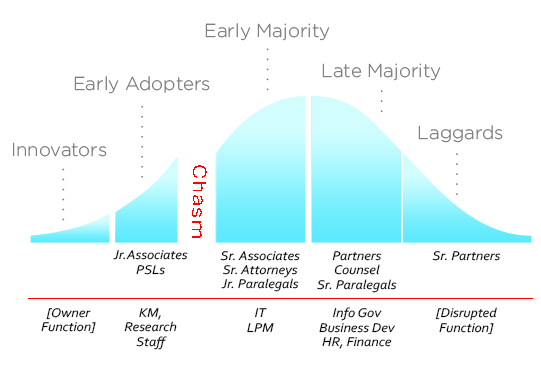 As I hope you have perceived from the foregoing observations, Moore’s technology adoption lifecycle model and the related advice in his book, Crossing the Chasm – Marketing and Selling Disruptive Products to Mainstream Customers, offers a rich framework for analysis of technology adoption in BigLaw firms. Whether or not you agree with my specific application and structuring of the key law firm factors involved, the exercise is a worthwhile one to undertake. It puts a stake in the ground for validating what works and does not work in your own innovation efforts. Take note that Moore’s books cover a lot more stimulating ground than what I have emphasized here. Check them out, starting with Crossing the Chasm.